Guinea’s win over Uganda in the AFCON qualifiers was the fitting finale to a compelling story, writes Matt Carter. After a week of breathless week of AFCON qualification – which contained no shortage of dramatic stories – we review the most significant talking points as January’s showpiece grows ever closer. 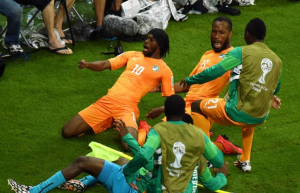 On what was a breathless weekend of AFCON qualification action, Nigeria and Ghana paid the price for contentious decision making post Brazil 2014.